You are probably aware (hopefully) that most colds and flus are not caused by bacteria, they are caused by viruses. Therefore, standard antibiotics are useless as a remedy for colds and flus. There are now anti-viral medications, but in a recent study, they only reduced flu symptom length from 7 days to 6.5 days, and may have some side effects. Plus, who really wants to schlep into the ER when you feel lousy and your immune system is already compromised? Secondary infections are often more dangerous than the original virus. Getting the flu shot may not help, either. Because of the ability of the flu virus to quickly mutate, in a given year, the flu vaccine may be ineffective on over half of viruses sampled by the CDC. It turns out that many common herbs are not only antibacterial but also antiviral, and have minimal to no side effects. 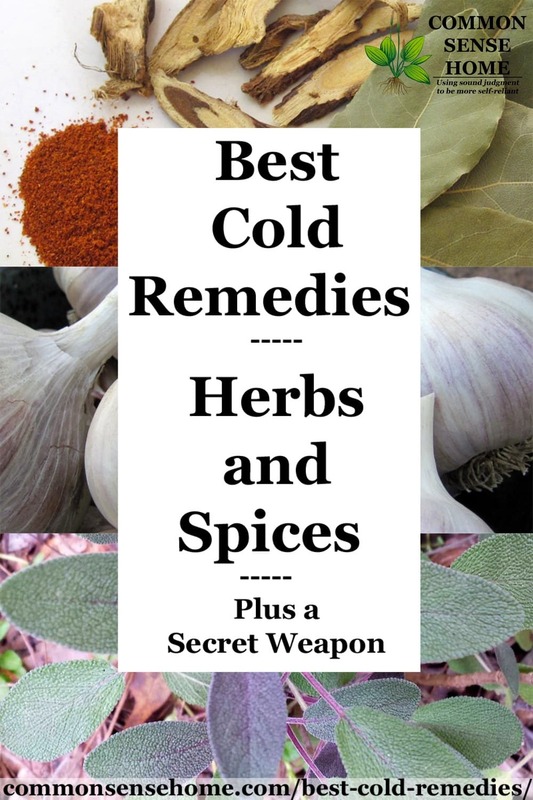 In the book Herbal Antibiotics, Stephen Harrod Buhner presents his top choices for cold and flu fighting herbs, including echinacea, wormwood root, balsam root, boneset, red root, licorice, sage, garlic and honey. (Honey is not an herb, but is often used in herbal medicine.) Complete dosing instructions and contraindications are in the text. I highly recommend the book, as it gives not only practical information on herbal use, but an overview of the history of antibiotics and how antibiotic resistance spreads. Technically, he includes both herbs and spices in his arsenal, as various plant parts are used. An example of the easy to use recipes that Stephen provides, such as The Best Cold and Flu Tea. To prepare the tea, pour one cup boiling water over sage and allow to steep for 10 minutes. Strain out herbs, add remaining ingredients, and drink hot. One of my favorite remedies for cold and flu season is a big batch of chicken soup. Chicken contains an amino acid called cysteine. Cysteine can thin the mucus in your lungs and make it easier to expel. Proper soup often includes an assortment of herbs and spices, many of which have healing properties. I include bay leaf in soups, which is anti-bacterial and anti-fungal. Parsley is rich in vitamins and minerals, and can act as a stomach soother. Sage is another herb that is popular with poultry, and is also anti-bacterial and anti-viral. Fresh sage is best when available because many of the beneficial compounds are concentrated in the oil. Celery, too, has a long history of medicinal use. Cinnamon, nutmeg, rosemary and cloves are also warming spices that may boost your immune system. Put some extra cinnamon or nutmeg in your eggnog. Be generous with the spices in your pumpkin pie or scones. Throw some extra sage in the stuffing. Make a rosemary vinaigrette for your salads. Experiment with the flavors. Regular use over time will help boost your immune system. Another way to get in your herbs is with these easy homemade cough drop recipes. One uses chocolate and orange (vitamin C is also good for colds), and other uses a mix of cold fighting herbs. Rule of thumb: Strongly scented and flavored herbs and spices come with strong oils that can add flavor, improve your health and often extend the life of your food. Under normal daily conditions the level of multi-resistant Staphylococci Aureus (MRSA) bacteria decreased by a third, and their resettlement on copper door handles and switches decreased considerably. In our home, we have copper handles on all the cabinets. 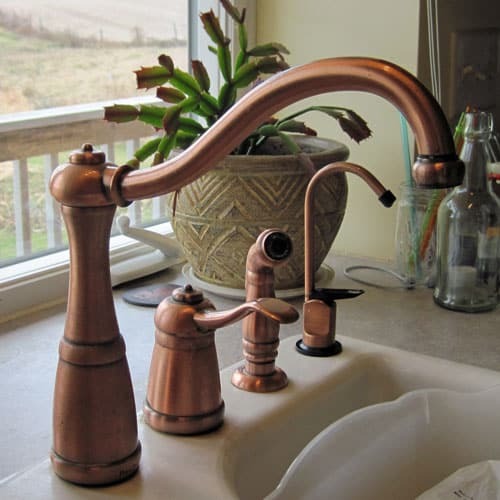 We also have a copper faucet in the kitchen and brass door handles (brass is typically 63% copper and 37% zinc). Not as much copper as in the study, but we're not coping with MRSA. If you don't have a big budget, swap out drawer pulls in your most heavily used areas. For instance, change out the main bathroom or the kitchen. You can use herbs to make Thieves Vinegar to spray on surfaces as a natural germ killer. If you've found this post useful, please share it with your friends. 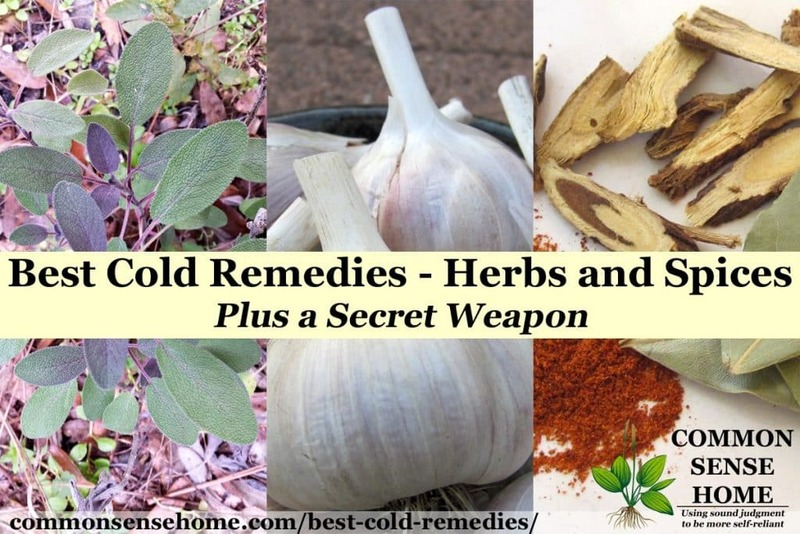 What are your best cold remedies? Leave a comment and let me know what works for you. Originally published in 2011, updated in 2015 and 2016. A tea of white clover, ginger, mint, chamomile, and honey will kill 90% of the cold within 24 hours. White clover is all over the place where I live, and I have used it to kill colds, aid in flus and bronchitis and pneumonia symptoms, and have even given it to a couple of COPD/emphysema patients with noted relief of their symptoms for nearly 8 hours. Do some research on white clover – it is a wild edible, can be used as a flour additive to baked goods (offers a vanilla sort of flavor to the baked goodies), can be eaten raw or cooked, and is a very potent medicinal herb when used to treat respiratory infections and illnesses. Made into a salve, it also has topical uses for things like psoriasis. I have eaten and used this particular plant for years now, and my daughter is also learning as well. 1. Fill half of a metal tea ball with either fresh or dried clover leaves and-or flowers. 2. Warm up water to where it’s just starting to boil, then drop the tea ball into the water. Add mint, chamomile, and ginger tea bags. 3. COVER the cup, and let it steep for about 10 minutes. (If you don’t like a very strong mint flavor, then pull the mint bag out of the cup after 5minutes, and re-cover). 4. When done steeping, pull all tea bags out (making sure to squeeze into the water), and discard. Remove the clover tea ball. Add honey to taste, and drink. *NOTE* If you are susceptible to the sedative qualities of chamomile, then either do NOT add the chamomile, or only take the mixture in the evening, before bed. When I give this tea to people, I generally give it to them in the late afternoon or early evening, and tell them to ‘sleep on it.’ By the next day, most symptoms are either greatly reduced, or gone. Each part of the tea serves a medicinal purpose, so you really do need all of the parts. You CAN leave parts out, but remember that in doing so, you are also leaving out the medicine. Ginger – works very well on the GI system, and also is wonderful at settling upset stomachs caused by constant coughing and mucus drainage/post-nasal drips. Mint – painkiller, and if you breathe the vapors in as you drink, it also helps open up the sinus passages to relieve some of the stuffy feeling. Chamomile – light sedative, works on the central nervous system, as a result it helps reduce the coughing reflex so common to colds and flus and other respiratory illnesses and conditions. If you are female, and on your menstrual cycle at the time, I would recommend leaving the ginger OUT of the tea if you have a tendency to suffer from cramping during your period. The ginger can sometimes exacerbate the cramping because of the way in which it works on the GI system. My daughter cannot handle ginger in any form while cycling for this very reason. Thanks for sharing you experience, Seliah. 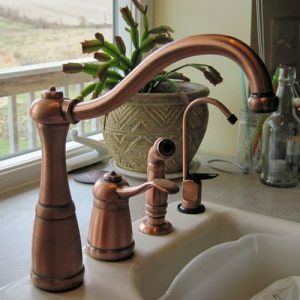 copper– then I wonder, would jingling a few old copper pennies in your pockets during the day kill some germs too? It might indeed slow them down if you gave the pennies a good rub. Hi there, I just wanted to say I love your blog!!! so many great tips. One thing I wanted to know is if you are familar with CHAGA ? Its the number 1 antioxidant in the world, it has healing properties aswell as boosts your imune system, you find it on birch trees only then dry it and either make tea or a double extract by soaking the outside (black part) in a high alcohol for a couple months, as the outside only disolves in alcohol while the inside is only soluble in hot water (tea) mix together and you have a double extract 🙂 It has even been proven to fight cancer cells and many, many other diseases, its been used in Asia and siberia for centuries, and now even some doctors are recomending it to patients instead of chemotherapy. I have now been drinking the tea everday for close to a year and a shot of the extract every so often (winter) and havent been sick since and I have always sufferd from colds and flu’s in the fall as I dont got the best imune system but that has changed now. I add some honey or lemon or both and it makes a very nice tea much like a breakfast tea. I was turned onto Chaga from my employer who has been drinking it for 30 years and hasnt rememberd when he last had any bad sickness, and we are wildlife viewing guides that are out in all weather conditions in central British Columbia. I’ve read about it but haven’t worked with it, and figured it would be harder to find than the herbs and spices listed in the post. Thanks for sharing your experience. Always more to learn! If it is made from birch bark does it then have aspirin-like, salicylic acid, compounds? This would possibly produce anti-inflammatory and blood thinning effects? Just wondering. It doesn’t look like salicylic acid is the likely active compound in chaga. This website https://oriveda.wordpress.com/chaga-the-facts/ has a good breakdown of different chaga claims and likely active ingredients. I have both of Stephen Harrod Buhner’s books. (Herbal Antibiotics and Herbal Antivirals) HIGHLY recommend them!!! The Antibiotic book had two chapters (Ch. 8 : A Handbook of Herbal Medicine Making and Ch. 9: An Herbal Formulary) that made price of the book worth these two chapters alone!!! And the bibliographies, both book and medical journal are awesome! He goes more into detail about medical journals (how to access/read) in the Antiviral book. I’d take these books with me to the doctor to show him WHY I need that culture done. This author also has a sense of humor and isn’t afraid to use it!!! I got mine through Mother Earth News, but I’m sure that Amazon is another good source. These books have a “forever place” on my Keeper Shelf!!! And have started hunting for some of the books from his bibliographies as well. I have the original Herbal Antibiotics and the second edition (which is much more comprehensive), as well as Herbal Antivirals, The Lost Language of Plants and a couple more of his books. The volume of knowledge he has accumulated and shared over the years is amazing. Winter is the season that affects most our health. To keep healthy, I try to drink as many hot liquids as possible. I also try gargling every time I get a sore throat. It does wonders. Chicken soup and warming spices are also of great help. Wonderfully written article! I got to try this….